When we first started with chickens we built three chicken tractors to handle 20 hens our neighbor gifted to us in exchange for some fresh eggs. After a couple years we decided to raise a flock of mail order chicks to replace those hard working hens and built this rough chicken coop. We had a very limited budget and wanted to use as much recycled materials as we could and ended up making a very poor chicken coop. It was big enough for chickens but I failed to make it big enough for easy clean out. A future coop would be high enough off the ground so a wheelbarrow could be level with the floor to make clean out easy. It would also have multiple chicken tunnels made from PVC conduit and chicken wire that extends out from the coop with doors for easy rotation. 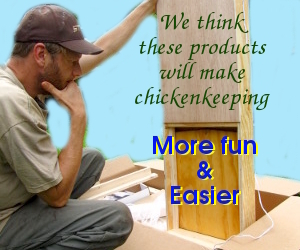 A roll out nest box that worked and a feeder that kept out birds and rodents would also help to make raising chicken easier. What innovation am I forgetting? What feature would you add to a dream chicken coop? Backyard Chickens has a new chicken coop write up that is out of this World! Some clever Artistic urban chicken keepers created this Cosmic Chicken Coop masterpiece from two 10 foot satellite dishes they found on Craigslist. A trampoline frame holds it all up. Maybe if the frame was painted a similar color as the ground it might look like it’s floating under certain lighting conditions. We’ve been searching for a cheap way to raise meal worms without using costly cereal products. In the meantime an easy solution is to order a big bag of dried meal worms. It can help if your chickens are molting or have been cooped up during a week of snow.